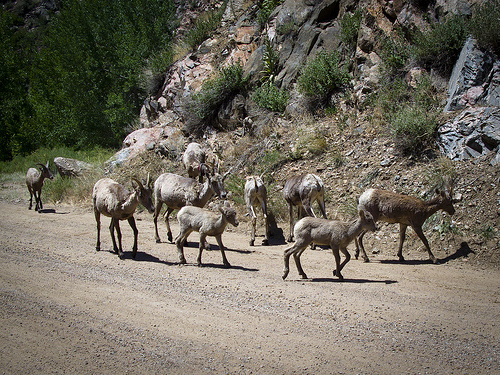 We saw this group of bighorn sheep in Waterton Canyon. 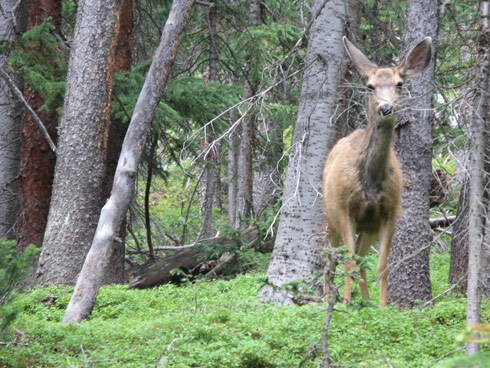 They are almost always out pretty close to the trail. The males weren’t out though. 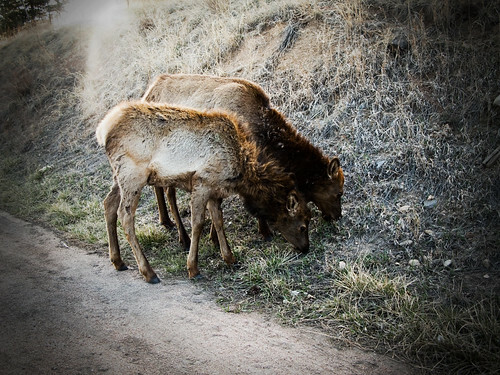 The males have the wide big horns that wrap around. some of the older females in this group have the shorter thin horns. The mother seemed interested in checking out my bike. Goats on Mt Evans, originally uploaded by rPawela. This was the first Trail I hit on my September trip to Colorado. 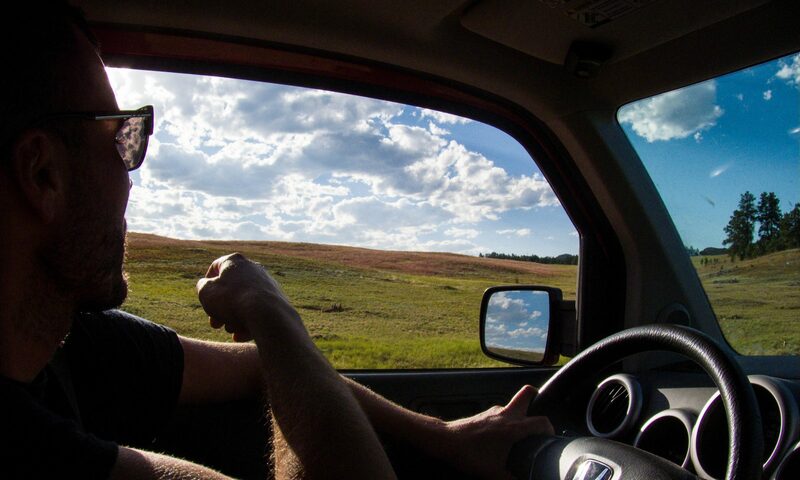 Finished Driving in from an overnight in Nebraska and headed straight to the trail after checking in to the Hotel in Golden which happened to be less than 5 miles from Apex Park, Red Rocks, Dakota Ridge, Falcon Mountain, and Green Mountain Trails. 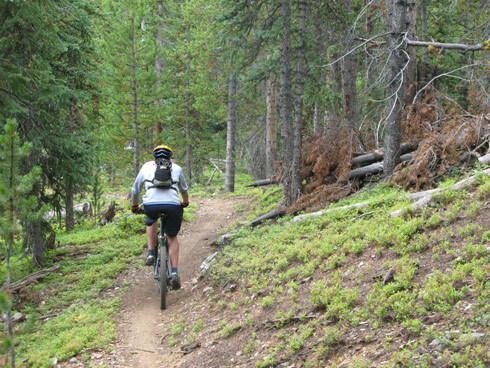 I could have spent a week in that area exploring the Front Range Trails and Denver Mountain Parks. Unfortunatly I only had 2 days so I decided there was no time to waste. After about a half mile of the climb on the Apex Trail, I was winded. The elevation hit me. I got off my bike and felt like I was going to vomit. 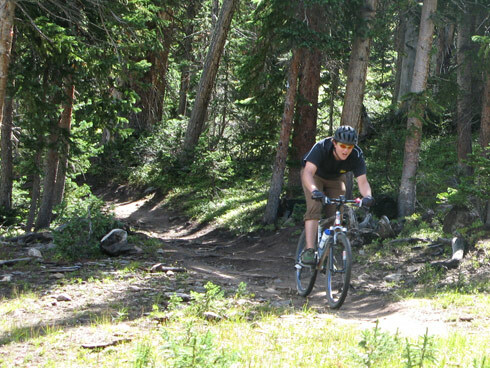 I was discouraged and wondered how long it was going to take for my body to get used to the elevation again. I got back on my bike, jumped into granny gear and slowly paced myself up the trail stopping every half a mile to catch my breath. After a few stops and reminding myself to take it slow on the climbs, I was feeling much better. Apex Park is pretty rocky and technical. Although this is only a 6 mile trail, it definitely wore me out. There were plenty of sections I had to walk my bike through. It would have been nice to have a little more travel on my bike to blast through some of the rough sections but I managed. Here’s some photos. 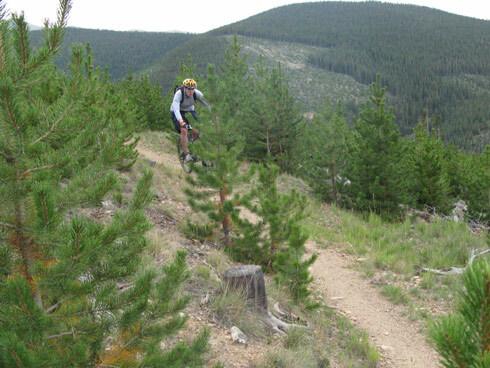 I didn’t manage to get any photos through the “Enchanted Forest”, a forested fast singletrack that traverses the side of a ridge across from the Apex Trail not to miss. You need to update your Flash Player to view this gallery. On the second day of my September Trip to Colorado I was more adjusted to the altitude and I had a ride in the mountains under my belt so I was feeling more confident. Unfortunatly it was cold and rainy and didn’t look like it was going to get nice. 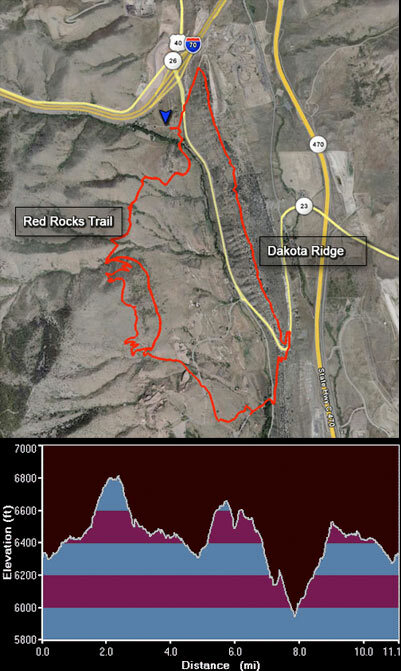 By around 2:00 I figured I’d head out to the Red Rocks & Dakota Ridge Trails. I’d seen photos of these trails and they looked pretty sweet. I’d planned on riding these trails last year but never got around to it. I was pretty excited. The weather managed to stay pretty tame. Although it was pretty cloudy it stopped raining and the trails were pretty tacky and not too slick. 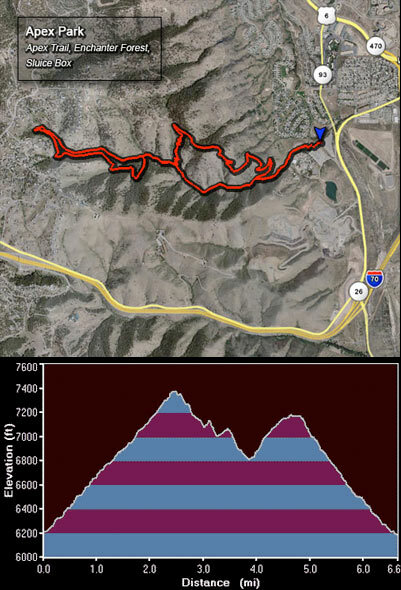 I started out from the Mathew Winters Parking lot and headed south on the trail towards Red Rocks Park. I took a short Detour on a trail that heads to higher elevation off the Red Rocks trail. After a little while I met up with two locals who I rode with and showed me around the area. The next day we headed out to the actual Red Rocks amphitheater which was impressive as well. This is a good intermediate ride. I’d say intermediate because of the elevation changes. If you are from the Midwest like me some of the climbs may be a bit more difficult to tackle. 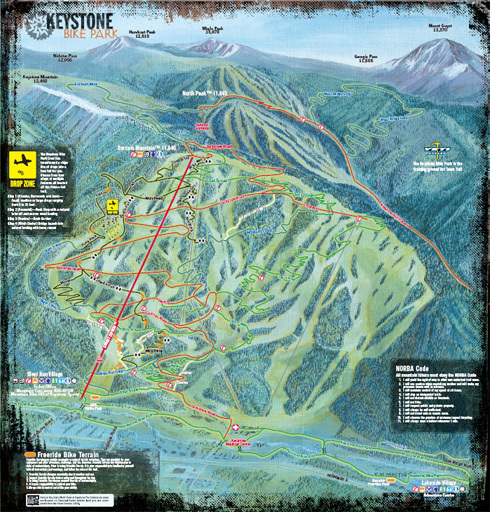 Start by heading up Landfill Road right across from Keystone Resort. Be watch out for big trucks heading up and down this road. 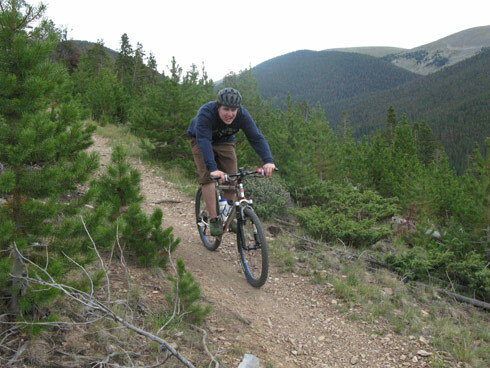 Once at the top, go through the gates on the left and take the singletrack switchback that heads further up the mountain. This trail will eventually lead into the Oro Grande Trail. The Oro Grande is a double track wide trail, smooth in some parts and rocky and jagged in others, with not much of an elevation change. From the Oro Grande you can get some great views of Lake Dillon. I believe if you stay on The Oro Grande Trail, it will join up with a few other trails and you can go as far as the Eisenhower Tunnel. 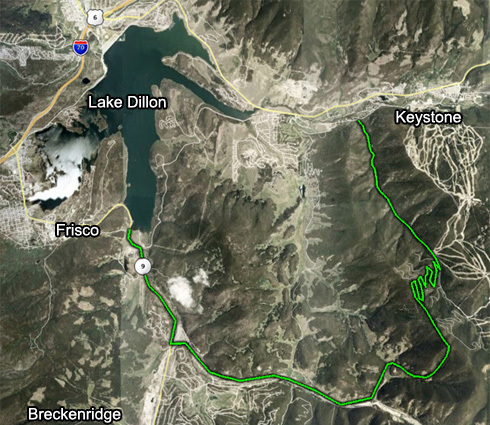 It will also Branch off towards Silverthorne if you want to take the paved path back to Keystone. 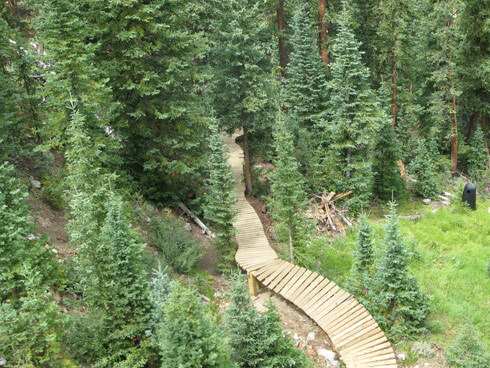 After awhile on the Oro Grande, You’ll see a trailhead for the Tenderfoot Trail on the right side which switchbacks all the way up tenderfoot mountain. I am not sure if this trail is open to bikes or not. There are no signs posted which prohibit bikes and after doing some research I haven’t been able to find a definitive answer. But when I was there I headed up the trail. 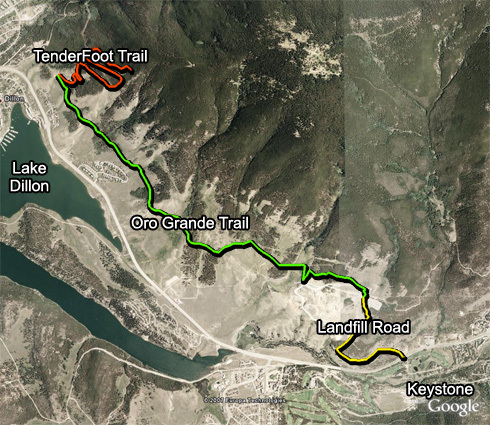 My Map image of the Tenderfoot Trail May not be very accurate but it gives a general idea of the trail. 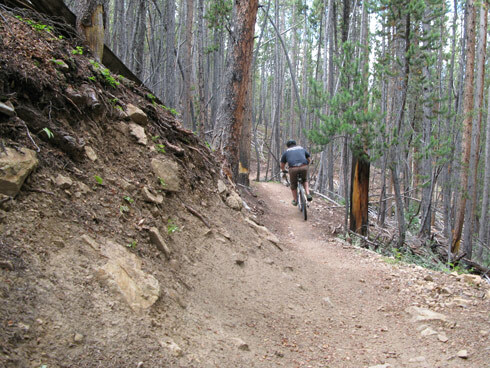 This trail weaves in and out of the woods as it switchbacks up Tenderfoot Mountain. It’s a pretty steep trail and can be difficult. I heard some loud thunder and didn’t want to get stuck out there in the rain so I headed back. The Downhill part was really sweet. 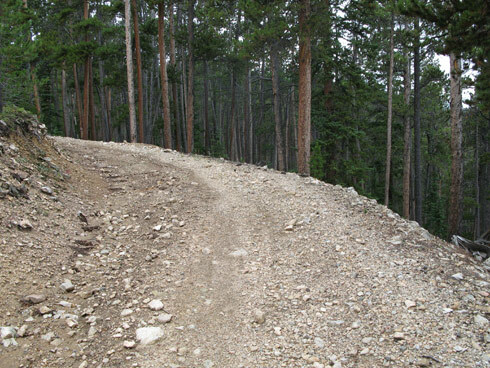 Next time I’m out there I am going to try and make it further up Tenderfoot Mountain, as well as explore some of the trails that branch off Oro Grande. 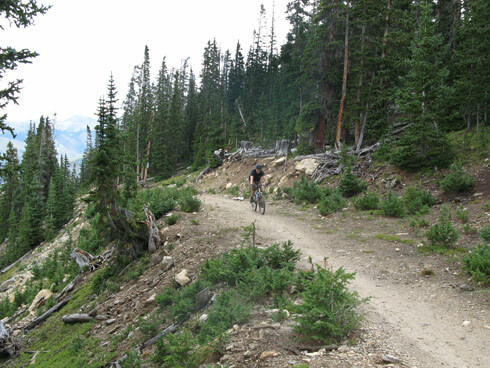 This summer my brother and I found a good bike route from Keystone to Breckenridge. What was planned as a quick warm up ended up being a pretty exhausting long ride. Us Midwesterners are not used to the Colorado climbs. We realized we’d ended up in Breckenridge. We were to tired to backtrack uphill and head back that way so we decided to head out towards Frisco. By the time we reached Frisco it started raining so we took the Summit Stage back to the Condo at Keystone. Next year I am bringing a GPS for sure. 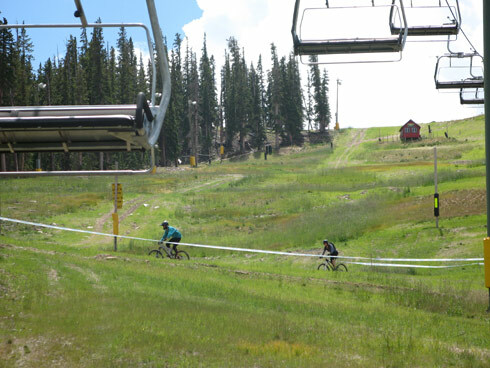 This summer me and my brother had the opportunity to ride the lifts at Keystone Mountain and experience some of their trails. It’s great to be able to take the chair up to the top of the mountain. Most of the trails cut across the mountain and run a decent length. On average it took us about a half hour to get down to the bottom. by the end of the day our arms and the palms of our hands were sore from the vibration of absorbing the terrain while going downhill, even with suspension and gloves. 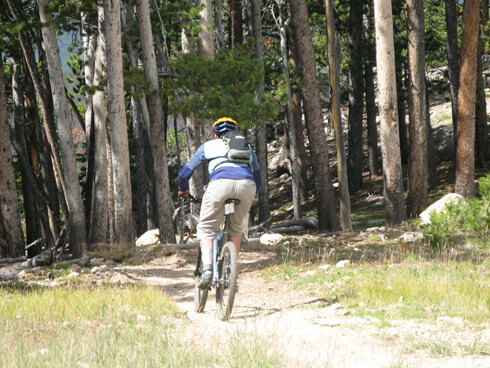 It is a bit intimidating riding at keystone because everyone is dressed in full-face helmets, body armor and their bikes look more like motorcycles without the motor. We avoided most of the freeride terrain and stuck to riding the xc trails which were crazy enough. Here’s a few pics of from the lift and a few of us riding.